At Kīlauea’s lower East Rift Zone, incandescence was intermittently visible at fissure 8 during the past week. Since the beginning of September, small lava flows have been observed within the fissure 8 cone, but none have extended outside the walls of the cone. At the summit of the volcano, seismicity and ground deformation remain low. Hazardous conditions still exist at both the LERZ and summit. Residents in the lower Puna and Kīlauea summit areas on the Island of Hawaiʻi should stay informed and heed Hawai‘i County Civil Defense closures, warnings, and messages (www.hawaiicounty.gov/active-al…). HVO daily Kīlauea updates are posted at volcanoes.usgs.gov/volcanoes/k…. Small collapses in the Puʻu ʻŌʻō crater during the past week produced visible dusty brown plumes and generated small tilt offsets and seismic energy recorded by HVO geophysical instruments. One earthquake with three or more felt reports occurred in Hawaiʻi this past week: a magnitude-3.6 earthquake 29 km (18 mi) southeast of Waikoloa at 32 km (20 mi) depth on September 11 at 08:54 a.m. HST. Aftershocks from the May 4, 2018, magnitude-6.9 earthquake are still being generated on faults located on Kīlauea’s South Flank. 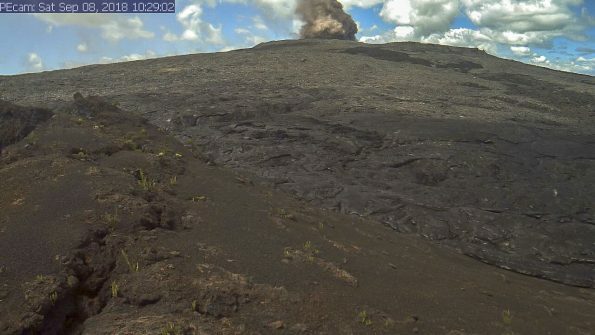 Please visit HVO’s website (volcanoes.usgs.gov/hvo) for past Volcano Watch articles, Kīlauea daily eruption updates, Mauna Loa monthly updates, volcano photos, maps, recent earthquake info, and more. Summary Kīlauea updates recorded at 808-967-8862. Email questions to askHVO@usgs.gov.